Since the Middle Ages the Marais, this central Parisian district located between the Town Hall and the Place de la Bastille has been the home of many Jewish people who came to France seeking refuge from all the persecution they endured in other European countries. 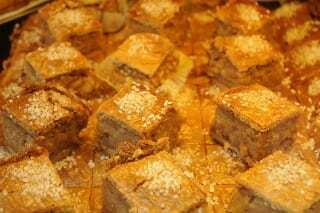 Of course they brought with them their culture and traditions, and among them Jewish cooking took a prominent part. For the last 40 years these delicious recipes from Central Europe, North Africa and Middle East became more and more popular with the Parisians and many restaurants, delicatessen shops or bakeries now welcome all kinds of customers. The epicentre of this activity is the Rue des Rosiers. Rosier means rosebush and roses used to flower along the Parisian ramparts where the street was created during the 13th century. Nowadays it’s the place to go to enjoy these tasty specialities. 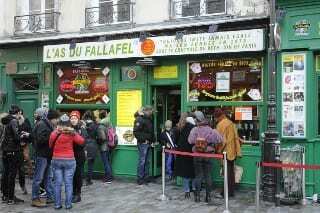 Walking in the Rue des Rosiers you won’t be able to miss “L’As du Falafel”: its green façade and the numerous customers queuing in the street waiting to get inside are unmistakable. The place is crowded and you will be seated at a small table shoulders to shoulders with the people having lunch next to you. The service is quick and you will soon be able to taste the crispy and delicious falafels served with hummus and marinated vegetables in this jolly atmosphere. It is said that Lenny Kravitz loves to have falafel in this simple restaurant! Further along “Chez Marianne” is a quieter place where all the dishes are also homemade. Almost all of the food is on display in the restaurant window and you can make your choice before being seated at your table. As soon as the weather allows it you can have lunch on their terrace enjoying various meze these wonderful Middle Eastern appetizers, falafels or the herbs and spices meatballs called koftas. 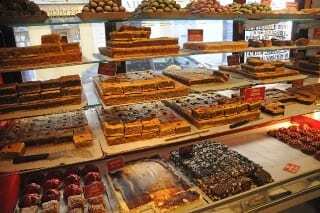 They have a large range of desserts: poppy seeds, walnuts, dates, almonds or pistachios strudels and their vatrouchka, a kind of Russian cheesecake looks more than tempting! 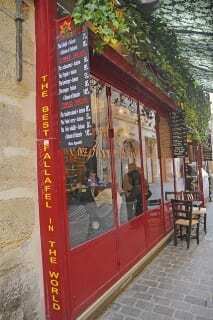 Located at number 27 “La Boutique Jaune”, the Yellow Shop, is the oldest delicatessen shop in the street. Apart from its gaudy yellow façade attracting the attention of all the passers-by you won’t be able to refrain from stopping in front of all the mouth watering cakes in the windows. 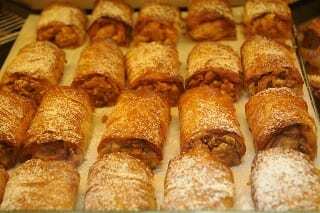 Since 1946 when Sacha Finkelsztajn opened this shop the family maintains the traditions by following the same recipes. They sell an amazing amount of food that you can take away or eat in their small restaurant: tarama, eggplant or pepper caviar, Albanian cheese, smoked salmon, marinated herrings, piroshki, bôreks, Hungarian or Polish goulash… Their cakes are an everlasting temptation: vanilla and sultanas vatrouchka, lemon or cherry vatrouchka, cinnamon and orange vatrouchka, Polish strudel with poppy seeds, Rumanian almonds and sultanas strudel, Viennese apple strudel or the unforgettable chocolate cake called “Reine de Saba”, Queen of Sheba. They bake their own breads such as razowy, bagels or pletzel with which they make delicious sandwiches. Opposite the “Boutique Jaune”, “Chez Hanna” is another kosher restaurant serving falafels, shawarma sandwiches made with meat cut from one of these big vertical skewers rotating and roasting in front of a grill or pitta sandwiches crammed with fresh vegetables coated with tahini sauce. 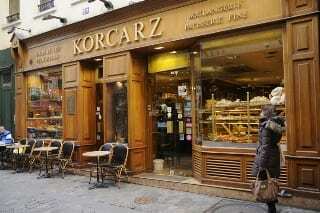 A little bit further you will get to “Korcarz” another must see shop in the Rue des Rosiers: this bakery was opened in 1946 by Joseph Korcarz descendant of a whole lineage of millers. The family is very successful and they now sell their breads and Viennese pastries in 54 countries. In their tearoom located at number 29 of the street you can have salted dishes as well as cakes prepared in the strictest observance of the kosher rules. 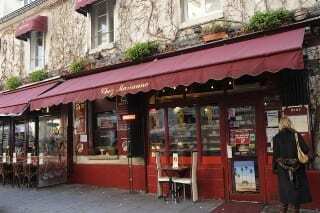 It obviously is not a problem to get fed in the lively and busy Rue des Rosiers! Don’t let yourself be put off by the lines of customers that often wait in the street, it never gets to long to get a table and you’ll get a tasty meal for a good value for money. 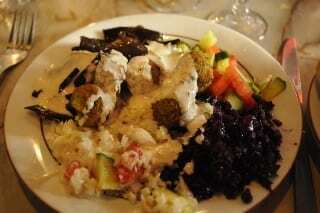 wonderful food. I shall get on my magic carpet and fly over straight away.